“I must go down to the seas again, to the lonely sea and the sky, and all I ask is a tall ship and a star to steer her by.” This is the opening line of John Masefield’s famous poem, Sea Fever. A “tall ship” is one characterized by high masts and great spreads of sail. Sea Fever was first published in 1902 and has since been loved by generations of sailors. 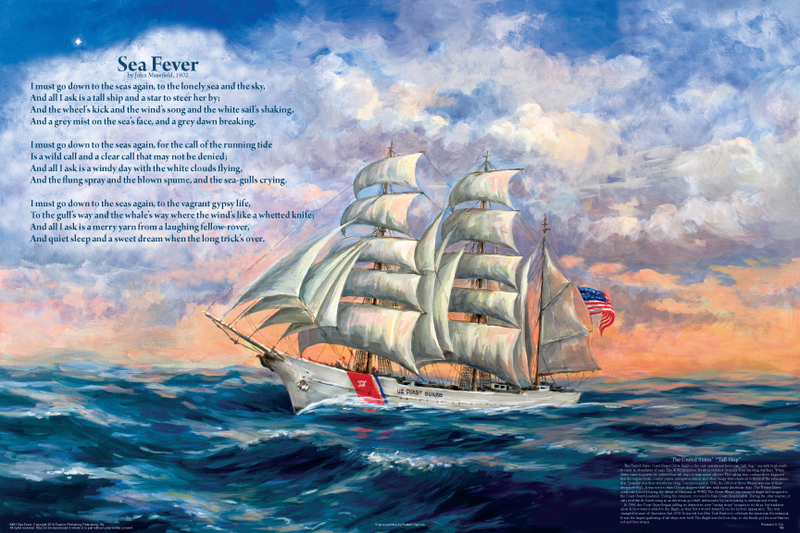 The full text of the poem is superimposed over an original oil painting of the United States Coast Guard cutter Eagle. The 295-foot barque is the only actively commissioned “tall ship” in American military service. The U.S. Coast Guard Academy uses her to train future officers during the summer months. The rest of the year, Eagle sails to many foreign ports as our nation’s good will ambassador. She was the only Coast Guard ship not to have racing stripes, as the traditionalists maintained that the stripes would be inconsistent with her historic design. However, she was the host ship of Operation Sail 1976, a coming together of tall ships from all over the world in New York Harbor to celebrate the American Bicentennial. Eagle finally got her distinctive racing stripes. The WWI Armistice Treaty prohibited Germany from building warships. When Hitler came to power, he ordered four tall ships to train naval officers. The sailing ship configuration disguised that the engine room, control center, navigation station, and other things were identical to those of the submarines that Germany was then secretly building. Commissioned in 1936, the Horst Wessel was one of these four deceptive ships. She was used to train U-boat skippers that later sank many American ships. The United States confiscated her following the defeat of Germany in WWII. The Horst Wessel was renamed Eagle and assigned to the Coast Guard Academy. Her three sister ships are still in service. This story appears in the lower right hand corner of the poster.